This session had multiple presenters and a ton of content. I types as fast as I could and also took photos when I knew I couldn't type fast enough. If something doesn't make sense, you may need to do a bit of research or contact the presenter for more information. Honestly, some will likely make more sense, if you understand that nation's laws. Every presenter did a good job laying out their country's copyright history, but each did it very quickly. The scope of copyright is tremendously broad and its lasts for many, many years. The mission of libraries relates to the mission of copyright. 188 member WIPO countries. 32 did not have specific library exceptions. 31 countries had general exceptions only, but not to specific activities. Who - libraries, archives, museums? What - published, unpublished? Articles, cull works? Music, movies? When - during the term of copyright protection? After? Why - conditions and proof? How - analog or digital? 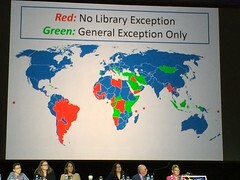 In those countries where there are library exceptions, there is a lot of diversity to those exceptions. 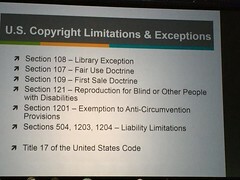 In the US, we will in gaps of Section 108 (library exceptions) with Section 107 (Fair Use). Very few countries in the world have innovated their statutes related to library exceptions. The public is the ultimate beneficiary of copyright law. How is the US government helping in this area? A snapshot of what's happening now. Ending perpetual copyright on unpublished works will - if passed - place millions of works in the public domain on the same day. They drew attention to this problem by digital recipes, placing them online and asking people to cook them! A radical act by librarians. APA (Australian Publishers Association) and ALIA (Australian Library and Information Association) book cover agreement, August 1, 2016. Makes it easier for libraries to use book covers to promote books and authors. This was a cooperative approach and they hope to do more cooperation. Their copyright act is over 700 pages. 41 minor amendments since 1996. Most exceptions are complex. Exceptions needed because they do not have fair use. They are in fair of expanding fair use. She believes they are closer than before of enacting something on fair use. A new law has been drafted and is now being reviewed. It has not been submitted to Parliament. All libraries did not have access to the internet until 2013, however, the electricity supply is unreliable, which impacts libraries and their users. She points their beginning with copyright law as being in the late 1400s. Poland regained its independence in 1918. It's new copyright law was passed in 1926. The core concept and basic assumptions shared with protection against unfair competition law. Copyright as a single, comprehensive right. Priority given to moral rights. Poland had a positive impact on the Berne Convention. The copyright law of 1952 was less friendly to authors. Another copyright law replaced the 1952 version in 1994. Amended in 2002 and 2004. The amendment of 2004 (I think) affects libraries. Having had public consultations on copyright law since 2011. Copyright act of 2015. Law was passed on Sept. 11, 2015. It still does not cover all libraries, since the wording is specific to education institutions. What is the definition of a "copy"? She quickly went through a number of slides, including slides on orphan works. Is a good faith search for the rights holder the same as a diligent search? All issues discussed at the national level can impact WIPO. 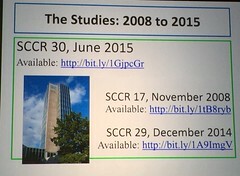 Since 2003, they have been focused on issues related to libraries. 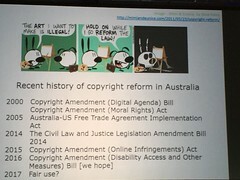 We need to educate ourselves about copyright, then educate our governments and lobby our governments. Finally, not everything is law or treaties. Look to develop partnerships. Question - Is there a best model for copyright? Crews, no. There a good pieces in many legislation. We all fall a little short on the new issues: mass digitization, data mining, orphan works. We need to pick the best from many different countries.